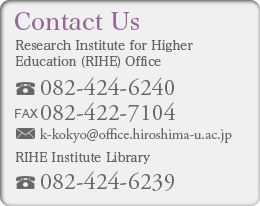 The primary purpose of RIHE’s programs is to train higher education researchers and university administrators or staff. The curricula of these programs follow a progression from basic to advanced courses in order to adequately prepare students for research in higher education. RIHE welcomes many students with diverse academic, professional, and ethnic backgrounds. The backgrounds of RIHE students are diverse. Some come directly from undergraduate colleges. Others were adult students who studied with us while working at universities as administrative staff. Others have some experience as academic researchers, while others began their careers working in private corporations. We also have some students from other countries. Our students differ in age, gender, undergraduate academic major, college from which graduated, and previous career. The career goals of students after graduation are also diverse. This diversity is our strength! This seldom happens in graduate programs of Japanese universities. We can learn many things from each other, and stimulate each others’ studies. Many changes are required to improve the current Japanese higher education system. The academic environment is rapidly changing, and we are faced with many problems and tasks. Higher Education as an academic field did not develop from one specific discipline. It developed as a multi-disciplinary research subject. People approach higher education research from various disciplines and using different methods of analysis. This situation is what makes research in higher education so attractive. Each researcher can choose the methods that suit him or her best. Faculty members of RIHE are not only first-class scholars in Higher Education but also great teachers and advisors. An outstanding characteristic of our graduate programs is that the teacher-student ratio is quite low. Classes are small, both in lectures and seminars. Students can freely ask their questions and express their opinions, and there are many discussions. RIHE seeks to conduct higher education research with many colleagues to make it more energetic and interesting. Anyone interested in higher education research or our programs or has any questions should not hesitate to contact us at any time.